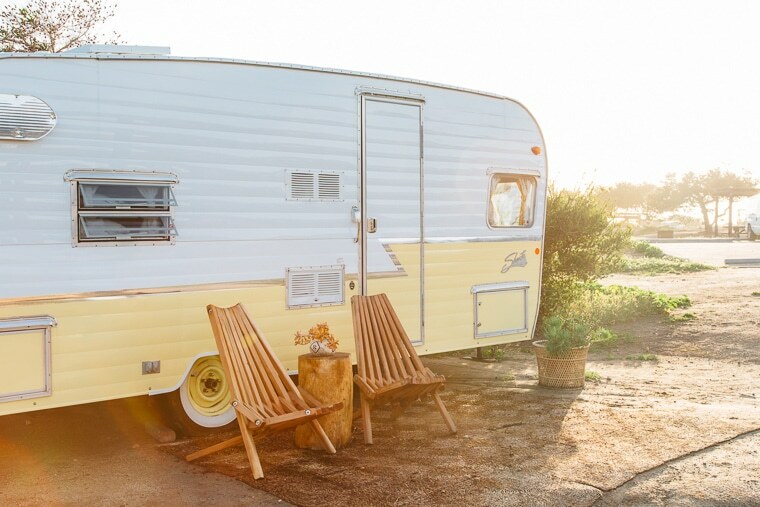 Vintage trailers for rent on an oceanside campground in Southern California? Sign us up! 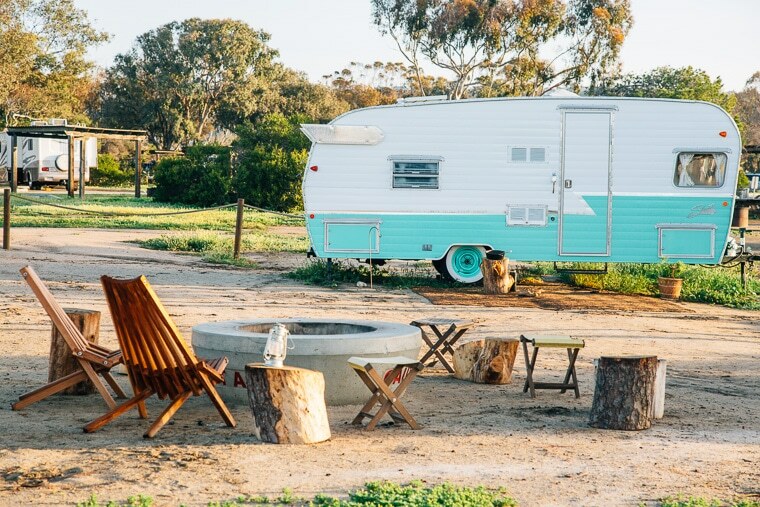 We were out in the desert somewhere when we found out about The Holidays, a retro-inspired camp community located on an ocean bluff. They reached out to us on Instagram, and from the moment we clicked over to their profile, we were in love. 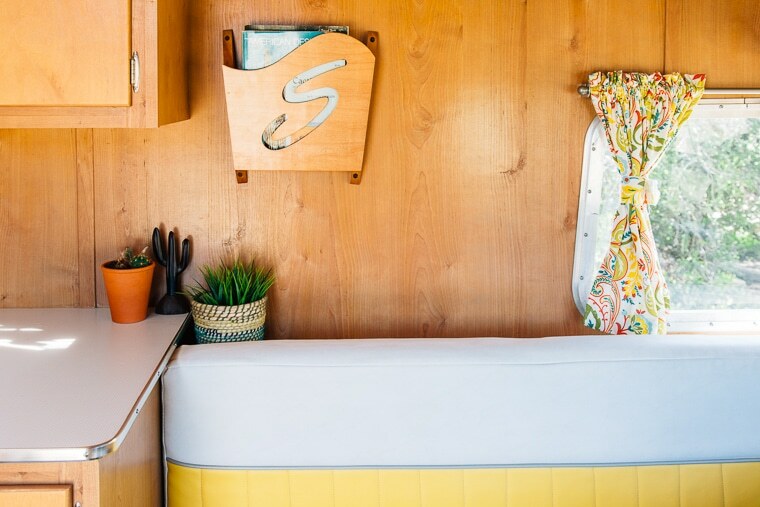 1960’s style Shasta travel trailers, golden California Dreamin’ campvibes, and expansive views of the Pacific ocean. We could practically feel the cool salty breeze coming off the water! To seasoned campers like ourselves, it looked like paradise. Thankfully we already had plans to return to the coast (our trip to Cuba departed from LAX), so we made arrangements to spend a few nights before we departed. 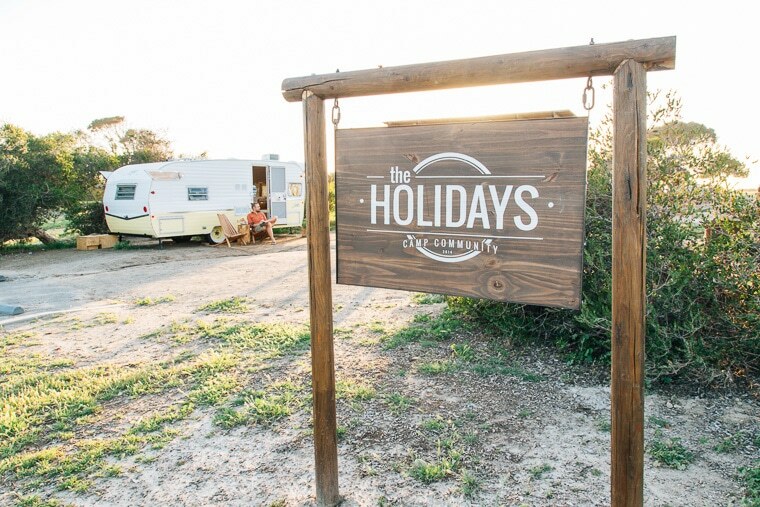 Located within the San Clemente State Beach campground, The Holidays CA is a partnership between entrepreneurs Andrew Bryan Jones & Kellen Van Ausdal and the California State Park system. In many ways, it was a perfect fit. 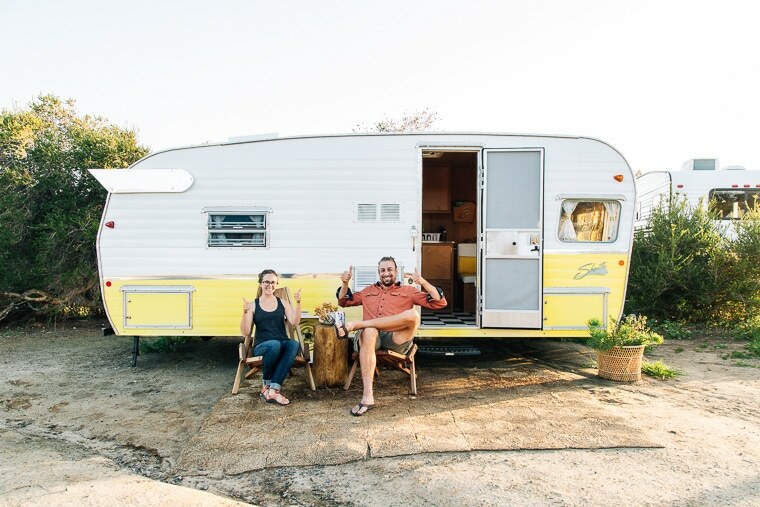 Andrew and Kellen wanted to offer people an elevated camping experience and the chronically under-funded CA State Park system was looking for a new revenue stream. So in August 2015, The Holidays CA opened their doors. We arrived late in the afternoon and were met by Andrew’s wife, Liz and her friend Anne, who showed us around the property. 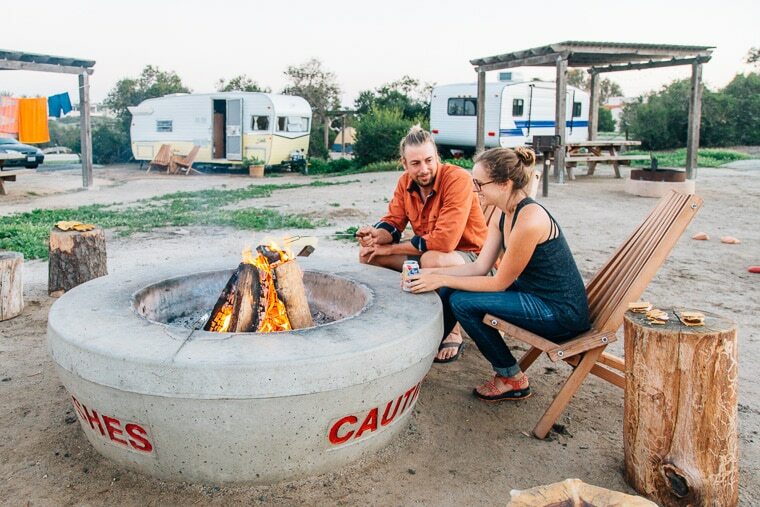 Three vintage style trailers have been positioned in a circle around a large communal fire pit. A fourth non-vintage yet handicap accessible trailer sits slightly off to the side. Each of the four trailers has their own picnic table, shade awning, and fire pit. While it’s conceivable you could stay to yourself, the relative positioning of everything fosters an engaging communal feel. Andrew and Liz’s two young boys were there as well, seeming to have the time of their life. A small tucked away toy shed houses a variety of outdoor games like bocce balls, corn hole bean bags, horseshoes, washers, plus a variety sand-digging beach toys. There is also a stack of board and card games, including the camping classic Uno. For anyone with young kids, having access to activities like this is pretty much like having a built-in babysitter. So while the trailers look like they’re straight out of 1960, Liz revealed that they are actually replicas. 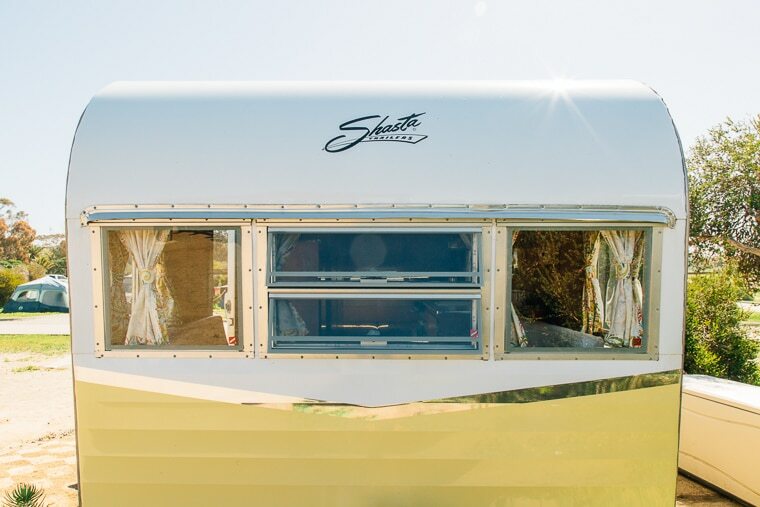 In 2015, Shasta put out a limited number of 1961 rerelease trailers, built to the original specs. (Shasta even got many of the original workers to come back to oversee the production). While the aesthetic of the trailers is exactly the same, all of the appliances have been updated. 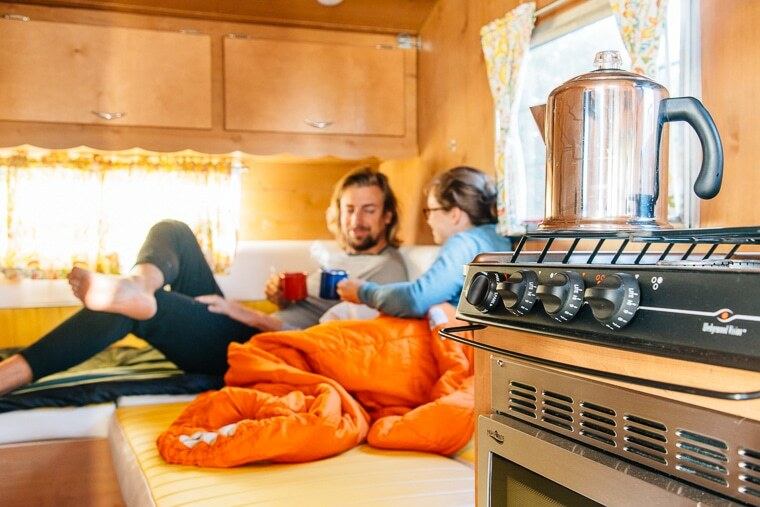 New stoves, convection microwaves, propane-powered refrigerator, water pump, cellphone charge ports, and energy efficient LED lighting. All of the electricity is powered by roof-mounted solar panels. The Holidays CA has also made a couple of modifications of their own. 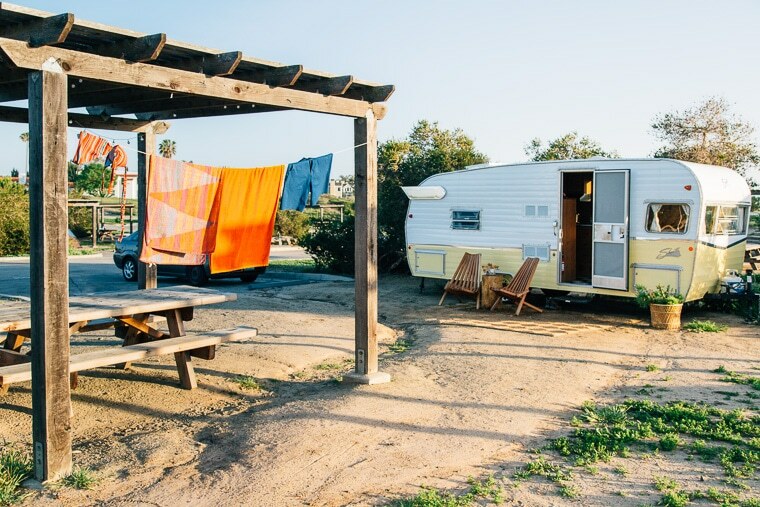 With the campground bathrooms and showers less than a stone’s throw away, they decided to remove the trailer’s bathroom and convert the space into a closet for luggage. 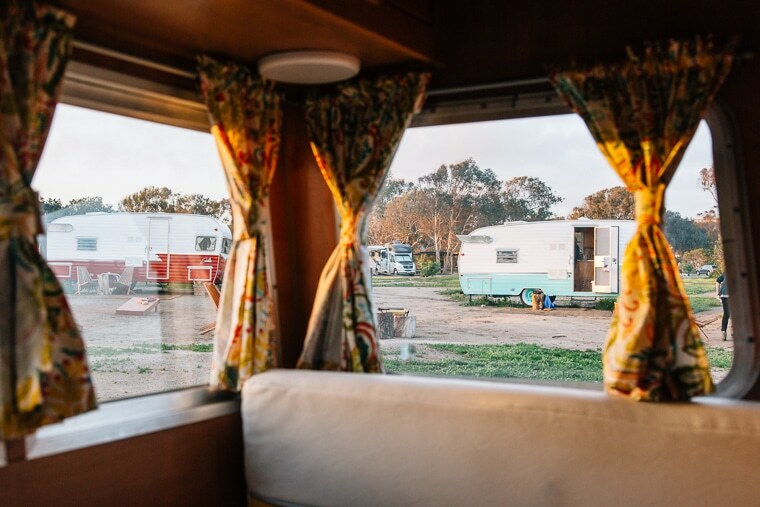 Not only does this eliminate the messy need of emptying black water tanks, but it also gives guests plenty of room to store all their gear without cluttering up the trailer. 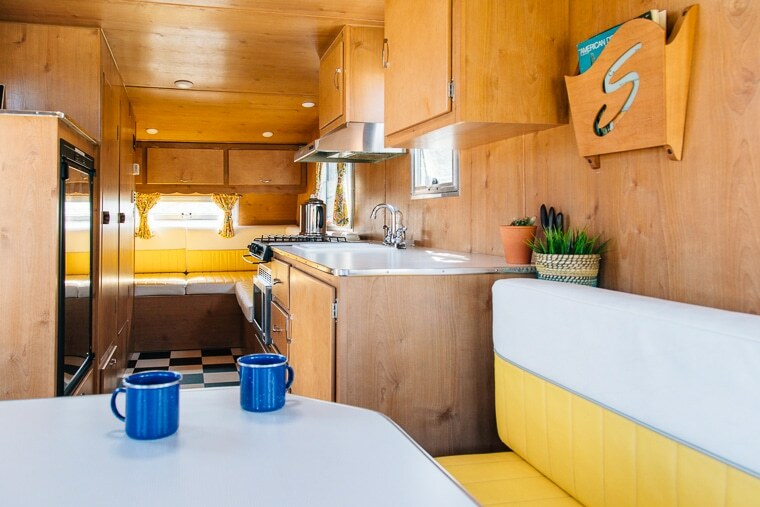 After we unloaded the car and got ourselves settled into our little yellow trailer, known as “The Roadrunner”, we sat down at the dinette table and looked at each other. 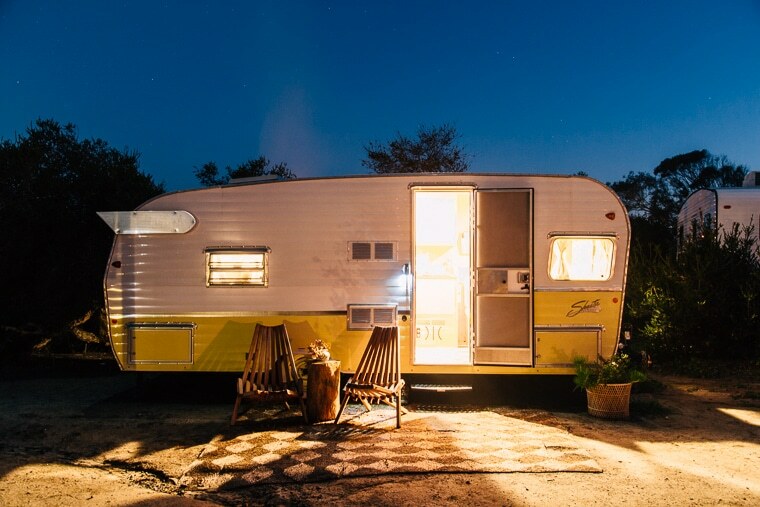 The same thought was going through our minds “They’re going to have to drag us out of here kicking and screaming.” Going from spartan conditions of #sedanlife to the relative luxuries of #trailerlife was, for us, like booking a room at the Ritz Carlton. Then again, we’re still pretty impressed by any living space that we can actually stand up in. The next two days were some of the most relaxing we’ve spent on this trip. A short but steep paved trail brought us down to the beach, where we spent much of our day watching the thunderous waves roll in. Back up at the site, we played corn hole in the afternoon, cooked over a campfire in the evening, and roasted marshmallows at night. When the fire died down and the air got a little brisk, we just moved inside and kept the party going. The best part of The Holidays was how easy everything was. Everything had been thought out and taken care of. From the stove-top percolator to the extra beach towels to s’more skewers, they had everything you might possibly want. 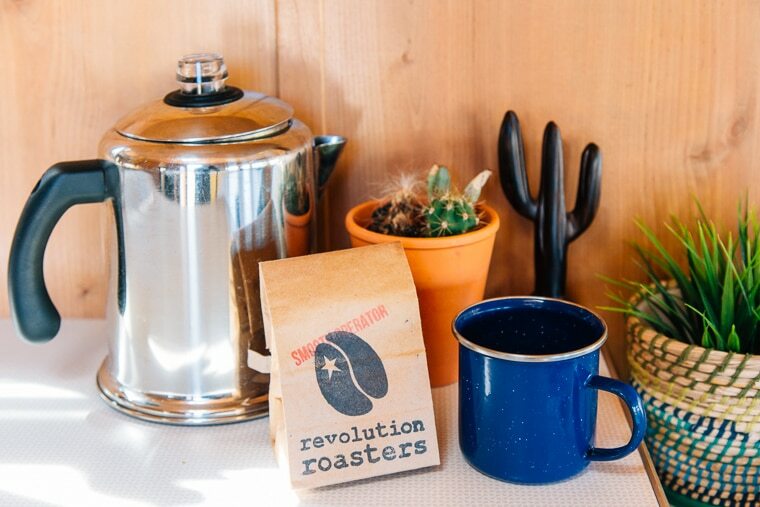 They even provided a little pre-ground bag of Revolution Roasters coffee for the morning. There was literally zero barrier between us and relaxation. And a lot of that can be chalked up to foresight and attention to detail of the owners. Andrew and Liz were also incredibly helpful. We didn’t have many questions during our stay, but we did need to ask about running a put-put generator to power our laptops (everything we do is workcation), and Andrew happily walked us through the whole thing over the phone. 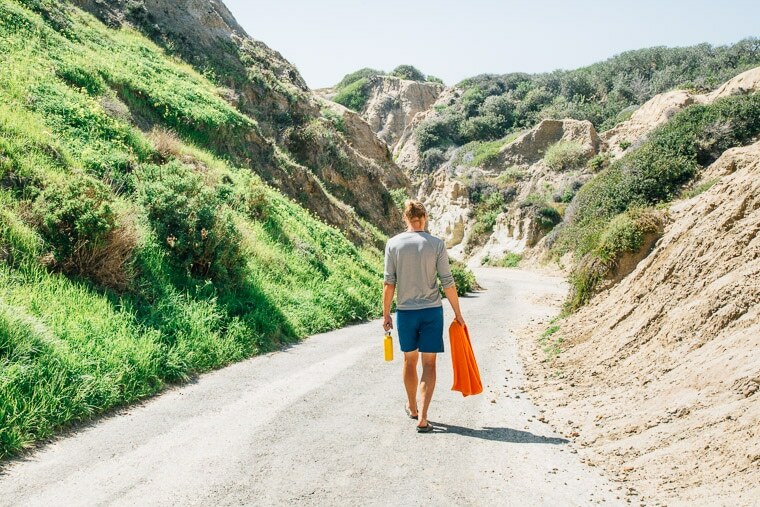 So if you’re in Southern California, we would definitely recommend stopping by. 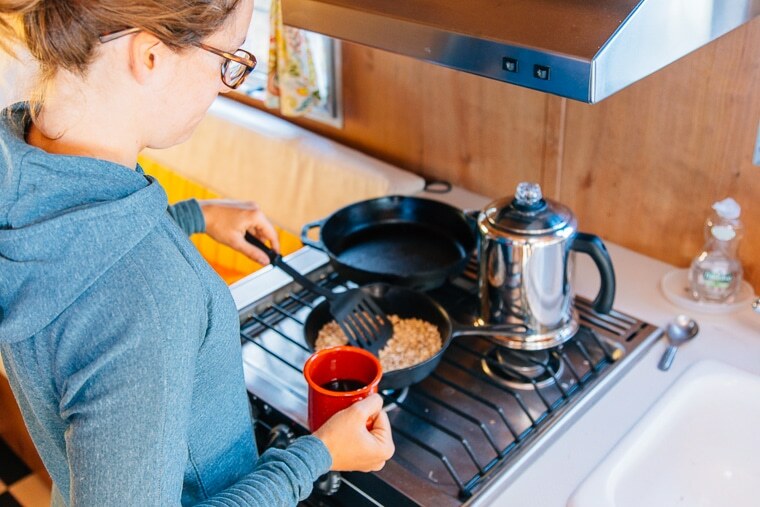 Especially for families with kids, reluctant campers, and groups of friends, The Holidays offers the perfect level of accommodation to make sure you get the most out of your time in the outdoors. Also, let it be known, after our stay at The Holidays, we now officially have trailer fever. We doubt our little Ford Focus can tow any more than a little red wagon, but we’re definitely going to look into our options. 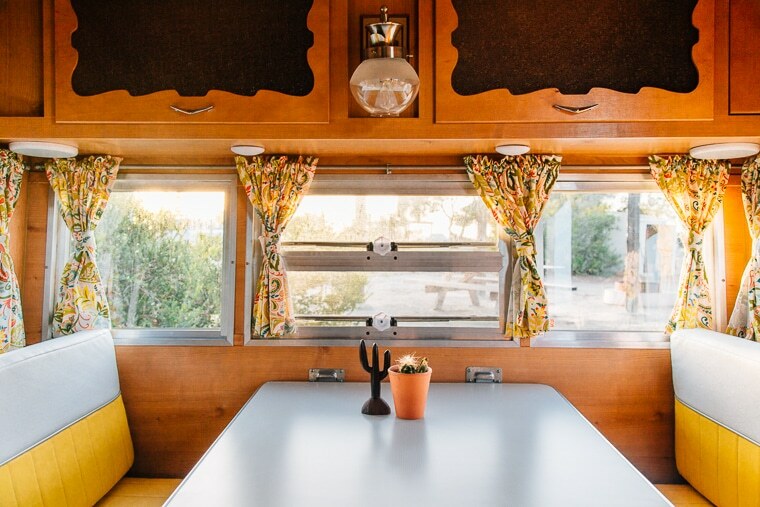 If you want some great California trailer vibes, follow The Holidays CA on Instagram, or to book your own stay, head over to Reserve America. We did not receive any compensation in exchange for this post, however our two night stay at The Holidays was generously comped. Thank you Andy & Liz! We had a great time! I love the look of teardrop trailers. I haven’t camped in one (yet) but I imagine it’s similar to tent camping – but you don’t have to worry about wind or critters! Ooh, definitely going to check it out. Hope you have some fun travel plans for summer! !